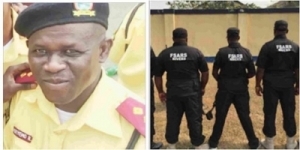 Police inspector attached to the Federal Special Anti-Robbery Squad (FSARS), Ikeja Wednesday allegedly shot dead an official of the Lagos State Transport Management Authority (LASTMA) while controlling traffic. Sources told the News Agency of Nigeria (NAN) that the LASTMA official named Adeyemo Rotimi, was shot dead at Iyana Ipaja area of Lagos. It was gathered that the LASTMA official was shot dead when he challenged the policeman, identified as Joseph Oki, for disobeying traffic rules. It was also learnt that the victim, popularly known as ‘Baba Ibeji’, had stopped the police inspector who was driving a cream coloured Highlander jeep with registration number LSR 277 BJ to allow free flow of traffic. It was gathered that the LASTMA official reportedly scolded the policeman for flouting traffic rules. It was learnt that the policeman attempted to flee the scene but was stopped by a mob. It was gathered that some policemen in the area reportedly rescued the FSARS officer from the angry crowd who also damaged his vehicle. Contacted, the spokesman for the Lagos State Police Command, CSP Chike Oti, did not deny the incident.